Sleep deprivation, whether it occurs over the short or long term, can lead to some characteristic symptoms. These resulting symptoms may range from the relatively expected and commonplace, such as sleepiness, to somewhat more serious complaints of hallucinations and memory problems. The degree of severity will depend on two factors. First, you will obviously suffer more from symptoms of sleep deprivation the longer the time that you spend awake. As an example, staying up an extra hour to watch your favorite television show is far different from getting only four hours of sleep. This may be especially true if the sleep deprivation occurs night after night or if it becomes extreme (such as “pulling an all-nighter”). Secondly, the intensity of your symptoms will vary depending on your circadian clock. Therefore, the symptoms of sleep deprivation will seem much more pronounced during times when you should naturally be asleep. Sleep deprivation may result in decreased alertness, excessive daytime sleepiness, compromised daytime abilities and major long-term health consequences such as obesity. The threshold for sleep deprivation may be different depending on an individual’s personal sleep needs, but obtaining less sleep than you need will inevitably lead to sleep deprivation. Explore some of the common symptoms of sleep deprivation, and you may recognise complaints that might encourage you to get the sleep that you need. No matter what you call it, the most common symptom of not getting enough sleep is what you probably expect: feeling sleepy. This might lead to a feeling of drowsiness or sleepiness, in which you have a strong desire to fall asleep. It might also lead to an associated symptom – a more deep-rooted sense of feeling run down, called fatigue. Many people use the word fatigue to describe the sense of muscle weariness in which a mild discomfort may occur. As part of this, you will actually be able to fall asleep quicker. People who fall asleep quickly are said to have a short sleep latency. This can be objectively measured with a sleep study called the multiple sleep latency test (MSLT). Aside from being a sign of sleep deprivation, short sleep latencies may also be a marker of excessive daytime sleepiness in sleep disorders such as narcolepsy. 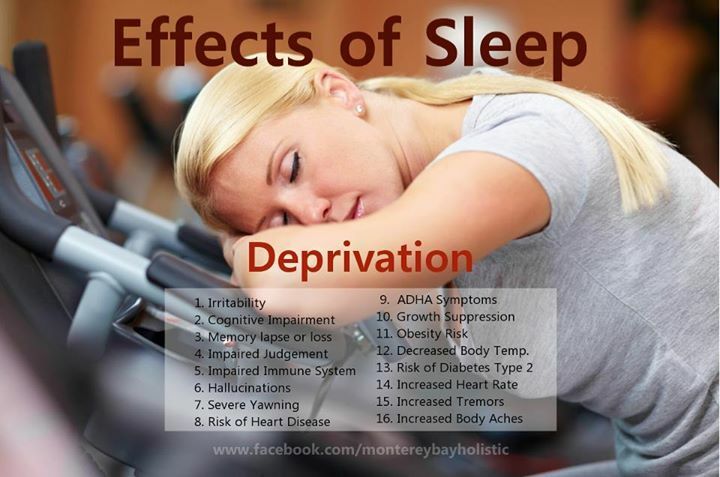 Conversely, sleep restriction and the resulting sleepiness can also be therapeutic. In certain settings, such as in those who suffer from insomnia, this added sleepiness may be desired. By limiting the amount of time you are allowed to sleep through sleep restriction, the resulting drive for sleep may improve difficulties falling or staying asleep, characteristics of insomnia. If you have ever found yourself short-tempered when you are not getting enough sleep, you certainly recognise the effects that sleep deprivation may have on mood. When we do not sleep enough, we are more likely to have symptoms of irritability. On the other hand, a good night’s sleep may put us in a great mood as we start our day. These mood changes may extend beyond a transient positive or negative attitude into more serious problems, such as anxiety and depression. The interplay between psychiatric conditions and sleep is rich. Many symptoms of depression overlap with those associated with sleep disorders. Problems such as post-traumatic stress disorder (PTSD) may lead to nightmares and sleep loss. People with chronic insomnia have an increased risk of suicide. Sleep is a vital part of our health, and this clearly includes our mental health. Your ability to be attentive to your surroundings requires a well-rested mind. When we are sleep deprived, we inevitably develop a subtle impairment in our ability to concentrate. This can be rather insidious, to the point that people who are chronically sleep deprived begin to fail to recognise their level of impairment. Decreased alertness may lead to errors, accidents, and compromised performance. Studies have shown that chronic sleep restriction leads to cumulative deficits in our performance. For example, in those people who sleep less than 7 hours per night, impairments in their cognitive performance accumulate to levels comparable to those who are completely sleep deprived for one or even two nights. This may result in decreased reaction times and lead to an increased risk of car accidents. It also impairs work performance. This may lead to errors and even headline-making disasters. Sleep deprivation in resident physicians has been targeted to reduce medical errors and patient harm in hospitals. It also has been partially blamed in settings as diverse as the Chernobyl nuclear reactor meltdown and transportation accidents such as the Exxon Valdez. There is some individual variability in the impacts of sleep deprivation, and the threshold for impairment may vary. There is no evidence to suggest that you can become adapted to sleep deprivation, however. Once you become impaired, you may not even realise it. Sleep has important effects on our ability to think and process memories. Therefore, when we do not sleep enough, these cognitive abilities can become impaired. Sleep deprivation may lead to further problems with higher-level functions, such as planning, organisation, and judgement. The most common symptom of sleep deprivation relates to problems with concentration and paying attention. Following close in step, however, is impairment in our short-term memory. This may be a consequence of decreased attentiveness (we don’t remember what we fail to register in our brain), but the difficulty may extend beyond that. Sleep is critical to processing memory. Sleep helps us to consolidate our day’s events, solidifying and recording critical memories. Research suggests it has a key role to play in learning. Therefore, when our sleep becomes disrupted, these processes, in turn, are impaired. The last, impaired judgment, can be markedly abnormal. Choices may be made that do not reflect your usual “common sense.” This may also lead to you underestimating your degree of impairment from sleep deprivation, as described previously. Sleep deprivation may also lead to some unexpected psychiatric consequences. These are surprisingly common, and much like the other symptoms, correlate with the degree of sleep deprivation. Some of the common psychiatric symptoms of sleep deprivation include disorientation, hallucinations, and paranoia. Disorientation is often part of the confusion that occurs in a condition called delirium. In general, people who are disoriented first lose track of time (mistaking the day, date, season, or year). Next, disoriented people may become confused about a place, not knowing where they are. Finally, in the extremes of disorientation, someone may not even know who they are. Hallucinations are a common sign of sleep deprivation, and they are typically visual in nature. In other words, you may see something that simply is not there. It is estimated that about 80 percent of normal people in the population will eventually have hallucinations if sleep-deprived long enough. Finally, sleep deprivation may also lead to another psychiatric symptom: Paranoia. Paranoia typically consists of a belief that you are being persecuted by some outside entity. These thoughts are not founded in reality. For example, you might be convinced that the government is tapping your phone in order to learn your secrets. One study found that approximately 2 percent of 350 people who were sleep-deprived for 112 hours began experiencing symptoms similar to acute paranoid schizophrenia. Fortunately, these psychiatric symptoms are quickly alleviated by adequate rest. You might have aches or pains in your body. You may complain of an upset stomach or gastrointestinal symptoms, such as diarrhoea. A medical investigation into these problems might not lead to their resolution if the underlying cause is overlooked and the symptoms are instead due to unrecognised sleep deprivation. Finally, sleep deprivation disrupts the natural flow of the sleep cycle. Sleep occurs in two basic stages throughout the night. The two stages of sleep are rapid eye movement sleep (REM) and non-rapid eye movement sleep (NREM). Arousal can be a shift from REM sleep to NREM sleep, or from NREM sleep to a state of being awake. REM is a deep stage of sleep with intense brain activity in the forebrain and midbrain. It is characterised by dreaming and the absence of motor function with the exception of the eye muscles and the diaphragm. It occurs cyclically several times during sleep, but it comprises the smallest portion of the sleep cycle. REM is one of the two basic states of sleep. The other basic state of sleep is non-rapid eye movement sleep or NREM sleep. NREM consists of three separate stages. The three stages are N1, N2, and N3 and each separate state have unique, distinct and recognisable electrical brain wave patterns. While REM sleep is the deepest state of sleep, NREM sleep takes up the largest portion of the overall sleep cycle. Sleep deprivation can have important consequences to your health and in extreme situations may even lead to your death. Moreover, it often leads to varying symptoms that can disrupt your life and your general sense of well-being. You may experience excessive daytime sleepiness or have problems with your mood such as irritability, anxiety and depression. It can undermine your ability to be attentive and concentrate, with important effects on your performance. Sleep deprivation may impair your short-term memory, as well as higher-level cognitive functions, such as planning and judgment. It might lead to psychiatric symptoms, such as disorientation, visual hallucinations, and paranoia. Finally, sleep deprivation may contribute to other physical complaints, such as fatigue or pain. These symptoms may have significant impacts on your life, and they attest to the importance of obtaining the quality and quantity of sleep that you need.